Known to me only by his initials E.D.F. for many years it has been possible to discover not only rank and regiment from the CWGC website but also details of his service history from Ancestry UK including his full name. 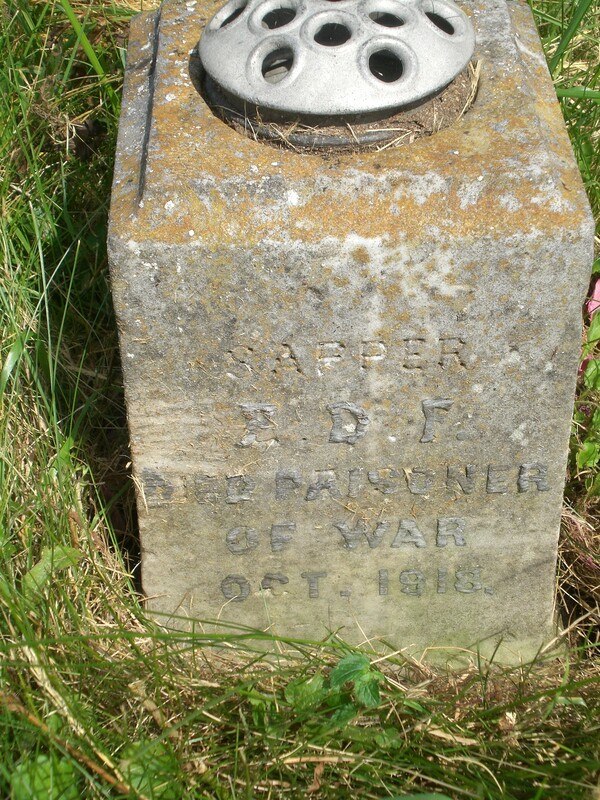 His initials appear on a small flower holder in the Reading Cemetery and there is an inscription stating that E.D.F died a prisoner of war. The Berkshire Family History Society classification is 2E3. In July 2016 this web site was contacted by Sapper Filewood’s great great nephew, Dean Fostekew, who has been able to supply further information. 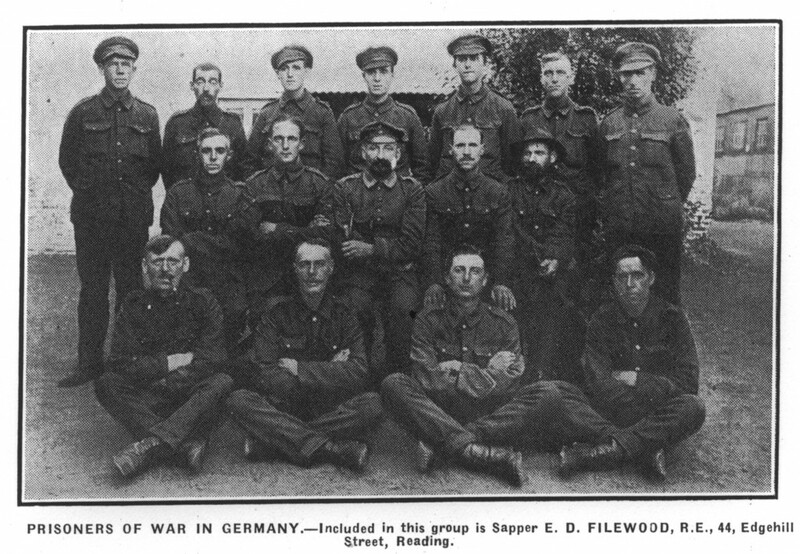 Sapper Filewood is standing in the back row of the photograph, second on the right and hat-less. Ernest David was the youngest of five children of David and Henrietta (nee Rose) Filewood. His siblings were Eliza, Phoebe, Fred and George. Phoebe was Dean’s great grandmother. Sapper E.D. 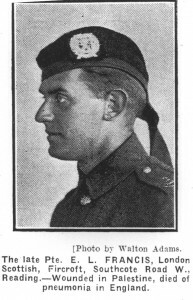 Filewood died on the 23rd October 1918. Aged 30 years. He is buried in the Tournai Communal Cemetery Extension, Tournai, Hainaut, Belgium. The grave location is II.J.33. The area of Tournai was in German hands for most of the war years 23 August 1914 until 8 November 1918 and is a concentration cemetery for small numbers of burials made in the surrounding area as well as a later casualty clearing station and hospital. There are many prisoner of war graves including a large contingent of Russian graves. By trade E.D.F. was a monumental mason. He attested in December 1915 and was posted to the Royal Engineers in May 1916. E.D.F. was posted missing on 10 April 1918 but sent a post card home on 20 April 1918 indicating that he was a prisoner of war. His war record indicates that his death was due to cardiac weakness during his capture. E.D.F. was married to L. V. (Lizzie Violet nee Saunders) on 18 January 1913 and they lived at 44, Edgehill Street, Reading. He left a daughter called Phyllis born on 23 June 1915. His wife remarried becoming Lizzie Violet Elphee and it is that name which appears on the CWGC register. James Albert Forrest was the eldest son of Mr John Alfred J. and Mrs Annie S. A. Forrest, 85. Albert Road, Reading. The 1911 census has the family living at 80. Rupert Street, Reading. James was the eldest son and he had six younger siblings, his brothers would have been too young to serve in the war. In 1911 at the age of 13 years James was recorded as being a hairdressers apprentice. His father, James had a hairdressers business. However, an obituary to James Forrest stated that he was apprenticed to Mr Walter Thomson as a hairdresser prior to enlisting. Walter Thomson was the father of Leslie Thomson whose details can also be found on this website. James was educated at both Newtown and Wokingham Road Schools. 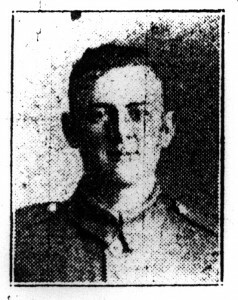 He had enlisted during the summer of 1916 and had served in the army for 17 months; he went to France in January 1917. James was aged 20 when he was killed on the 23 or 24 November 1917. On this day there was severe fighting around Bourlon Wood as the British pressed home the attack. James Forrest has no known grave and is commemorated on the Cambrai Memorial, Louverval, Panel 9. The memorial commemorates all those lost in the Battle of Cambrai from 20 November 1917 to 3 December 1917. Ernest Leyton Francis was the second son of Mr and Mrs Earnest Francis of Fir Croft, Southcote Rd. Reading. He was a chartered accountant and had enlisted under Lord Derby’s scheme in November 1915 joining up in February 1916. Es Salt, on the furthest side of the River Jordon, on May 1st 1918, he was taken to Egypt, where he remained in hospital for a time. He was evacuated to England returning on October 18th 1918 and admitted to the Napsbury War Hospital. Greatly enfeebled by the hardships he had previously undergone, he fell an easy victim to the prevailing influenza epidemic and later died of pneumonia. Arrangements were made for his remains to be brought home for interment in Reading Cemetery in the family grave. Brief details are to be found in the CWGC register but this investigation has found that the details as to the location of the grave are incorrect. He is buried in his family grave umber 11315 in Division 27 not grave number 16515 Division 80. Newspaper reports of the time comment that he was “deeply mourned by all his friends, by whom he was highly respected and esteemed for his high principles and Christian character”. 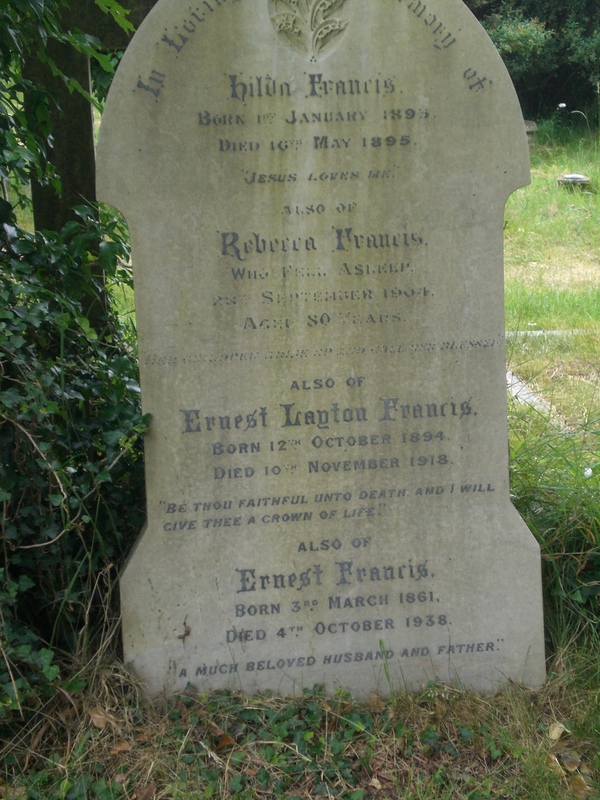 E. L. Francis was interred 14th Nov. 1918, he was 24.